A satisfied customer with a sea blue and red microfiber pet bed. Pet beds are available in three sizes to accomodate a wide variety of pets. All our pet beds feature a zippered, removable cover constructed from durable, stain-resistent microfiber fabrics for easy clean-up. Our bed beds are filled with a specially cut polyurethane foam which offers support and is sure to provide a favorite resting place for all pets. 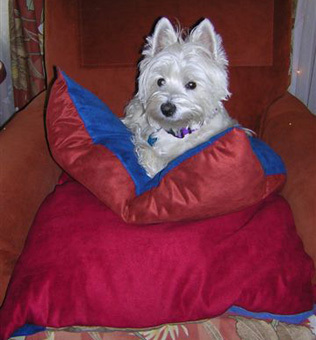 Customers can coordinate the pet pillow with the other furniture offered. Custom sizes are available upon request. Contact us for more information or for special orders. 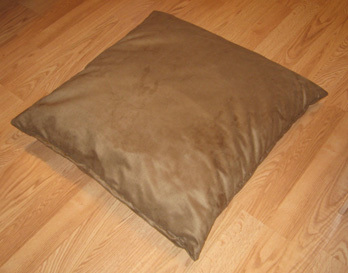 A small pet bed in buckskin microfiber. Rollover the image to see the cover removed! 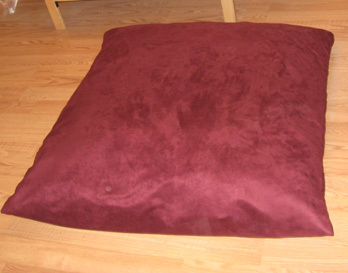 A medium pet bed in wine microfiber. Rollover the image to see the cover removed!